In December, children write to Santa Claus to tell him they behaved well during the year and ask for gifts. I no longer have the age for that! Nowadays I write to the summer and ask to have a few quiet days with sun, during the its period of governance. Instead of toys, I ask to have wines to comfort me while I convince myself that the summer will be eternal and that I’m still able to swim across the Sesimbra Bay. I’ll write here about some wines from Quinta do Gradil that I have in the bag. 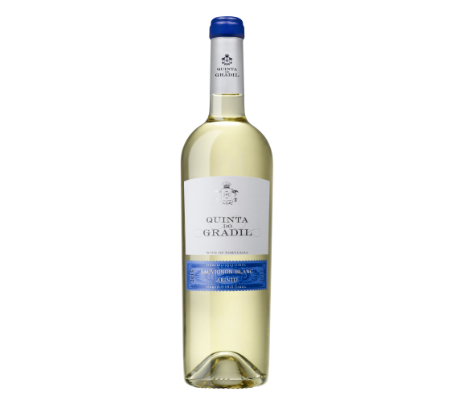 Quinta do Gradil is located in Cadaval, in the Lisbon wine region. The property is very old and had several distinguished owners, the first was Marquês de Pombal (The Marquis of Pombal). In total it has 123 hectares of vineyards and nowadays is birthplace of several wines. The oenology is in charge of António Ventura and Vera Moreira. I have often expressed my admiration for this oenologist, who is perhaps the one that produces more liters of wine in Portugal. What impresses me here is the way the grape varieties differentiate themselves while keeping their identity … how many times do we find equal wines of different grape varieties? Therefore, here, there is an added didactic value, features that help understanding the grape varieties. António Ventura completed 32 years working in Quinta do Gradil. He says that 2015 was a good year for reds in this property. 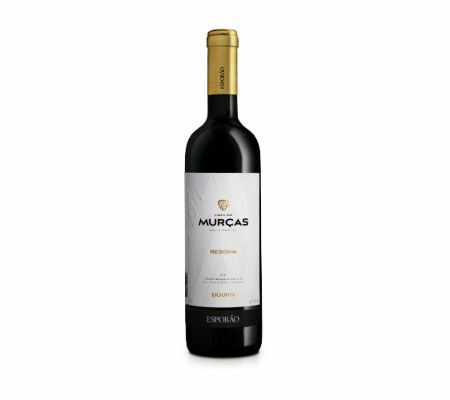 The Mula Velha Reserva White 2015 was made with Arinto and Fernão Pires grapes, and some Chardonnay grapes. This one is a good friend of summer foods. 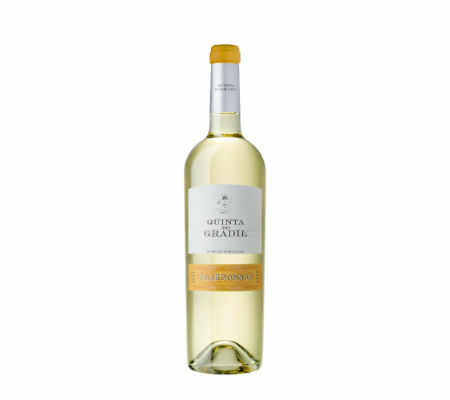 The Quinta do Gradil Viosinho 2015 is the summer in a bottle. 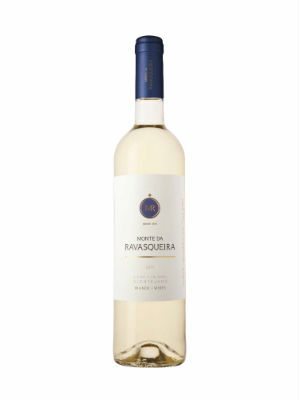 Very fresh, brings together mineral and tropical characteristics. It has the “grace” of being done with an improbable variety. 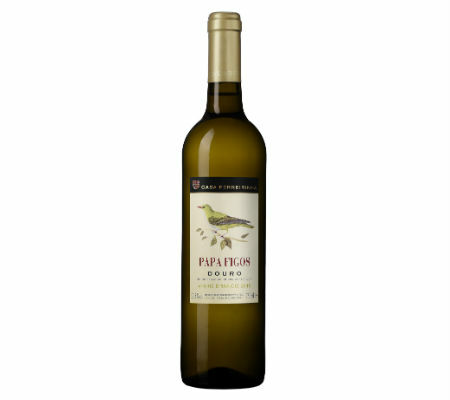 There is no record of this Douro grape variety going so far south the country. It is a wine to accompany conversation and shellfish. 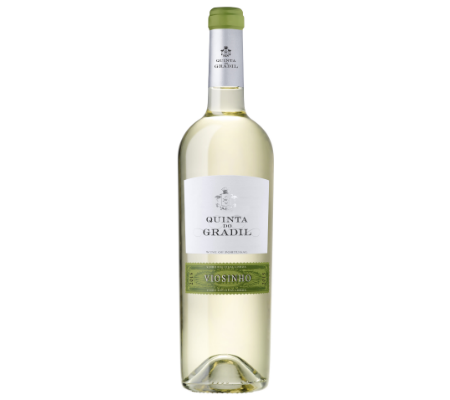 The Quinta do Gradil Sauvignon Blanc e Arinto 2015 is almost a classic. It is known that these two grape varieties work well together, and this producer early found the right formula. 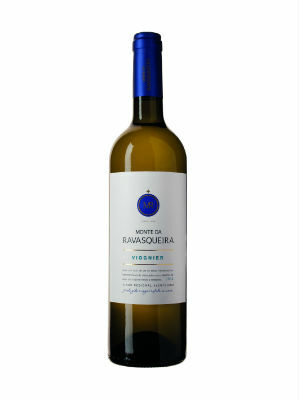 As the previous wine, it is a wine to accompany conversation and shellfish. The Quinta do Gradil Chardonnay 2015… Oh man! I really enjoyed it. It is unctuous and complex, with structure, it’s not heavy or cloying. To me, the wines of this property are always a good company for a conversation. This one likes to be at the table and is a good match for poultry meat. 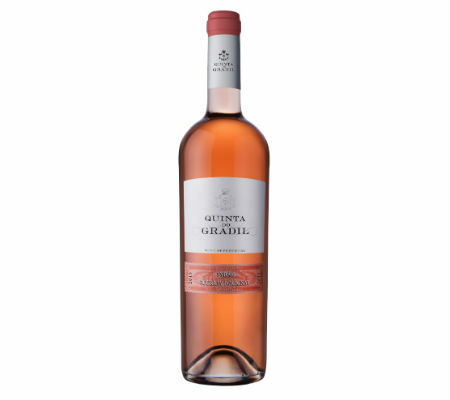 The Quinta do Gradil Rosé Syrah e Touriga Nacional 2015 is a wine for… the table and banter. Beautiful. I promised myself to write this chronic a long time ago. But, since nothing happened that would make it an emergency I was postponing it. Now has come the time that makes it urgent. The matter concerns two iconic wines from ‘unlikely’ and ‘impossible’ locations. If it was in France, an inescapable reference in the recognition of quality and differentiation, Foz de Arouce would have the status of the Burgundy micro-regions. It would probably be a ‘monopoly’. But the Arouce River is located in Portugal, as is the Ceira, who receives it. The other wine refers to a concrete place, but one that is not a wine location. The Bussaco (with two ‘s’) is beautiful and has one of Portugal’s most beautiful and historic hotels. However, the grapes that make their wines are from Bairrada and Dão. Now, this makes one plus one equals zero – having no right to use the designation of origin. 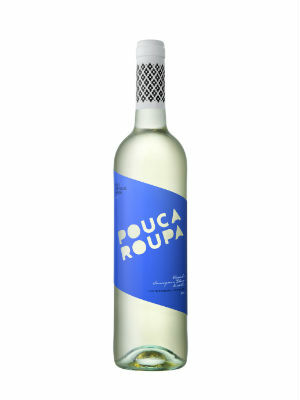 Though the wines are made with the grape varieties Baga from Bairrada and Touriga Nacional from the Dão, the Buçaco wines (with «Ç», so that it does not conflict with the bureaucratic dictates) are wines that can be said to mirror their territory because the vines have been the same throughout the years. It is as if they came from a single Quinta, divided by two specific regions. Authenticity and charisma abound. Allowing myself to push the concept out of the established, I say Bussaco is a terroir of cellar and bottle. I will assume as true the geographical location of the hotel. And so, these are two vinous places that are in a plasma dimension – neither solid nor liquid. Looking at the map, Bussaco and Foz de Arouce are not far from each other, just 36 kilometers. The path is beautiful and the road demands attention. The computer says that the trip between the two places takes 50 minutes. However, it took me more than an hour when I visited the two places in 2011. 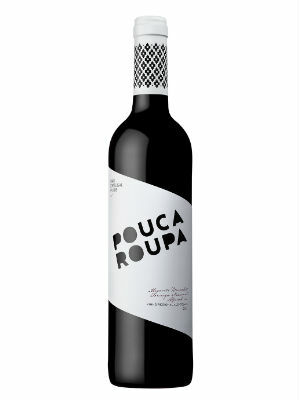 I mentioned that the Buçaco red wines are made with Baga and Touriga Nacional. That is because Foz de Arouce’s vine consists of those grape varieties. 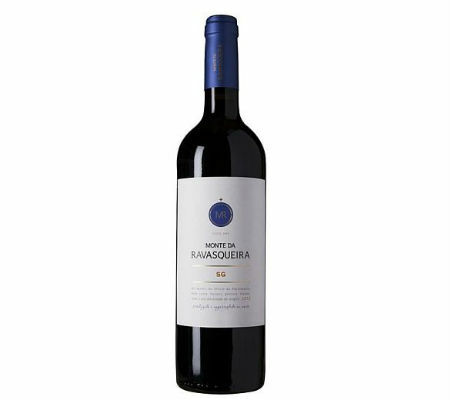 The winemaker and wine entrepreneur João Portugal Ramos is son in law of the Counts of Foz de Arouce and a few years ago he added the Touriga Nacional to the plantation that consisted only of Baga. 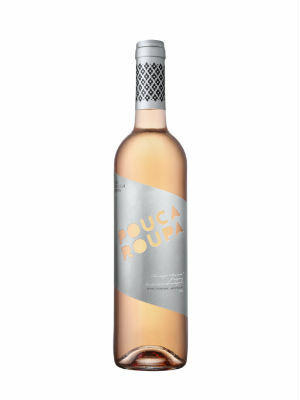 The Quinta de Foz de Arouce Vinhas Velhas de Santa Maria remains the same, while the Quinta de Foz de Arouce is now a result of the two grape varieties’ merging. I’ve already praised Foz de Arouce’s wines here. What I bring today is a special and commemorative edition. It’s a 2007 wine, produced to celebrate the 200th anniversary of the Battle of Foz de Arouce in which stood out a family member of current Count. 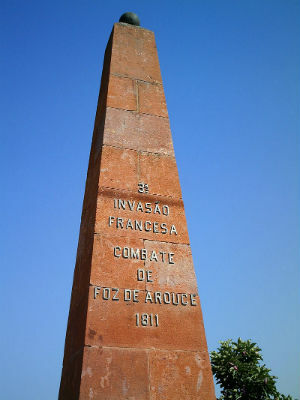 The Battle of Foz de Arouce was not a moment of transcendent importance in the context of the Peninsular War (III French Invasion). Some even just designate it as Fight of Foz de Arouce. It happened on 15 March 1811 when the Napoleonic army was retreating, pressed by the Anglo-Portuguese forces. 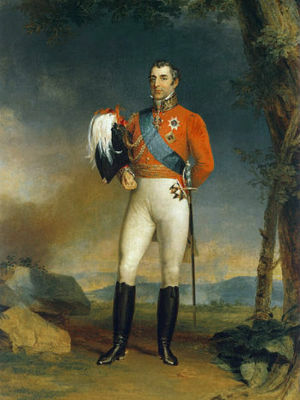 Leading the allies was Arthur Wellesley (the future Duke of Wellington) and leading the invaders was Michel Ney. Bussaco was also source to the name of a confrontation of the Peninsular War, with greater importance. 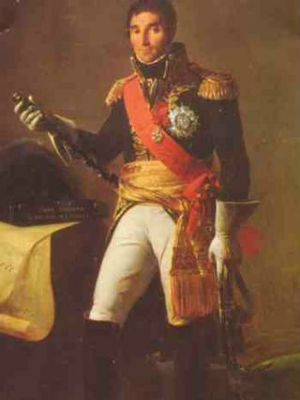 It happened on September 27, 1810 and leading the Anglo-Portuguese side was Arthur Wellesley, and leading the French was the commander of the III French Invasion, Andrè Massèna. The Allies came out victorious in both clashes. As for the wines, those who have the opportunity to have them do not hesitate. Face them and let yourself be conquered. They will win and the oenophiles will deserve them. I notice I’m evoking a specific wine of a particular year and another wine of which I haven’t even mentioned the year. I’ll add “all” Foz de Arouce wines and “all” Buçaco wines to the list. And why? Because they are all wines that deserve to be known, and that keep (obviously I haven’t drunk all the vintages, but I’ve came across many) their physical identity characteristics and differentiation of years. They are nectars able to evolve over time and to live long. This generalization is conscious and voluntary. I am averse to the list of descriptors, as for me, it just sums up the wine to a “thing”, because it becomes reductive. The “small wines” don’t surprise in the definitions and “great wines” surprass that characteristics’ counting. 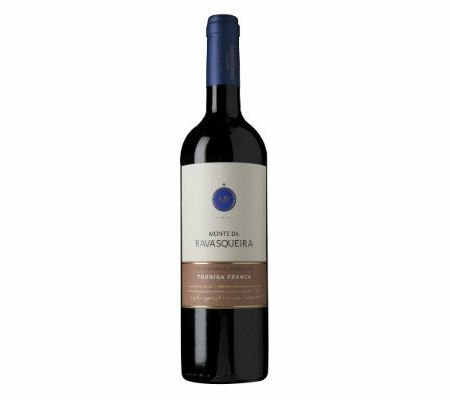 The Quinta de Foz de Arouce – Batalha de Foz de Arouce 200 years (2007) has in it what its siblings Quinta de Foz de Arouce and Quinta de Foz de Arouce Vinhas Velhas de Santa Maria have. The wine is more than the grapes, it is “that place”. Fortunately it’s not the same, as otherwise it would not be worth having another name, there would only be difference in the label. 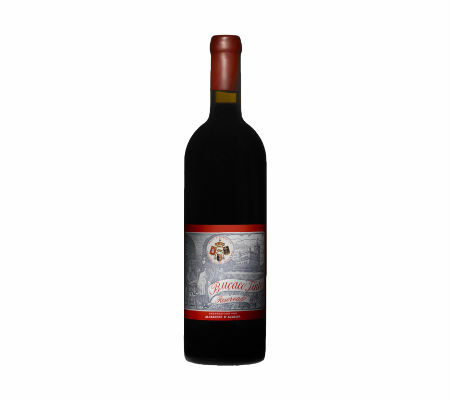 I drank it and I would keep drinking it longer had not the bottle only 0,75 liters. It has many years ahead. The Buçaco L2004 Reservado has the greatness it’s expected to have. Great in all aspects, alive and elegant, with many years ahead. The bottle had the same problem as the above: only 0,75 liters. By the way, I’ll explain the “L2004 Reservado” reference: because it is a table wine, supposedly the lowest category in the scale, this Buçaco could not carry its year indication. However, the description of the blend could be whichever one that the producer wanted. So, these nectars blends have the same numbering of the vintage year to which they correspond. Bureaucracy is not an exact science, it is often just stupid. Intelligence wins. Why can’t the table wine be “reserva”? But once again the bureaucrat was dribbled, the term ‘reservado’ is not covered by the objections. And like this, a bit of Portugal’s history was told. Boring people are boring! People Who want to be boring can manage to be boring. Being boring is probably one of the few things that does not require having a proper education, family or genes. The talent in being boring does not imply having talent. Now, being a snob is something different! If a boring person is an expert, the snob is boring person with a PhD. A snob can go for hours talking about the nuances of fishes’ livers, the evolution of the aesthetics of the Maserati’s rims or the green’s importance in the Islamic culture. For a snob, the Goldberg Variations by Glenn Gould are mundane. Above all … or below all … a snob is an arrogant. No gentleman belittles or brags. So, a snob is someone without nobility – sine nobilitate, the Latin phrase from which came the English word. This is because in wine there are boring persons and snobs … the boring ones are fun in the taverns and the snobs are unbearable in the lounges. In the taverns it’s no big deal to change places or flee, in more formal environments it’s not quite the same. It sounds simple, but I’ll complicate it. I believe no one has the right to impose their tastes and concepts. However, differences between individuals can be large and the breakdown is inevitable. 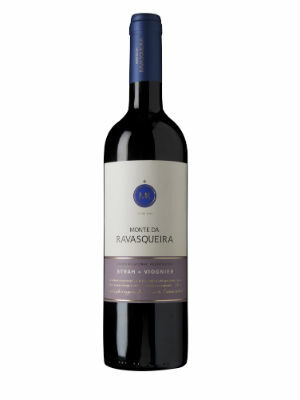 Other people don’t have to see the Touriga Franca as the world’s best, as I am not obliged to like the Antão Vaz. A few days ago I tasted wines with people of different nationalities and I realized that besides the banalities that set quality standards, nothing was converging the noses and mouths. The problem wasn’t in recognizing the quality or the lack of it, but in the difference of the attributes that separate a well-made wine from a good or excellent wine. A rosé should be sweet? A rosé should be sweet and have no acidity? A rosé must have, above all, acidity? They may seem silly questions, but it was a present subject. I am not the owner of reason and the opponents weren’t foolish or ignorant. They were people used to tasting and justified their statements. 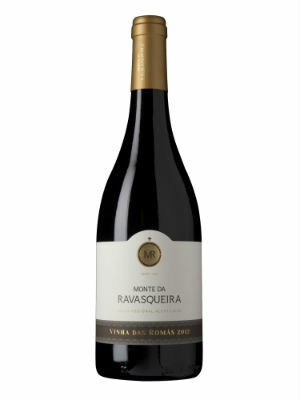 We, the Portuguese, have the craze to praise our wines because they accompany well the food and have acidity. Is this an advantage? We say it is … and if we just want to chat the night away, will we insist on the obligation of acidity? However, is a syrup happy in softening a dialogue? 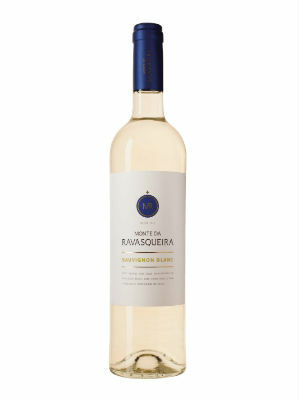 We, the Portuguese, have the craze to praise a lot the fruity character of our wines … but … is it an advantage? Honestly, the fruit often tires me and if it’s to taste like fruit, then I’ll drink juice – makes me want to scream. This said debate did not end with the rosés. This episode was just the best illustration of translation of crib, latitude, longitude and culture (ethnic sense). But I can add information from another conversation. When we value or penalize a wine by its color, are we being fair or accurate? 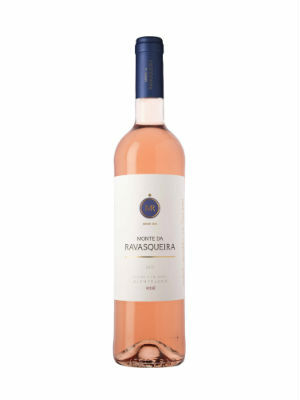 I’ll get around reds and whites … Is a rosé better or worse if it’s pink, salmon or orange? Is the color important or not? Or does the wine give pleasure through the senses of smell and taste and we just like to add things that are not connected? I have even heard, more than once, that the wine is fantastic, because it appeals to all the senses. Smell? Right! Palate? Right! Tact? Yes, in the mouth it shows roughness and softness … Eyesight? It has color, so you can see it looks good. Hearing? … We can hear the cork pop out. I swear! I’ve heard this feat more than once. I have to say that I don’t hold myself of happiness and joy when I hear the sound of a cork popping… It’s me with the cork and Pavlov’s dog with the bell! Quite frankly! And the color? Honestly, I only care for it while serving, to indicate the health of the wine. Debating color tones is as useful as knowing Pantone color references. Ah! The color of the Pinot Noirs… which ones? From Burgundy or Tejo? Wine is for the nose and the mouth! I think debating the color of the wine – excluding the visual assessment that lets you know the wine’s sanity – is like discussing skin tones. I don’t have knowledge or time to discuss the differences or variations of the grape varieties according to their location. Neither for certainties about the immutability of the characteristics of the wines of each region. The boring person knows everything, including the things that doesn’t know. The snob knows and thinks he knows everything, or at least more than others. In the end only one outcome is enough for me: pleasure. Either I had it or not. Fortunately, the mentioned conversations weren’t with boring people or snobs. What could have been a nightmare was a learning experience. The truth does not change, but because the points of view vary, the knowledge is diverse. I still do not like sweet rosés without acidity. But now I know that compared with a sweetened soda this wine can be fantastic. PS: I was a Snob before, now I’m just boring! There are people who need several lives. One of them is Aníbal Coutinho, who is not satisfied with only one task. He sings in the Gulbenkian Choir, he’s vintner, a oenologist, a consultant in Continente’s wine area, a wine critic and author of wine and food tours, and he worked as a sommelier in Jacinto restaurant in Lisbon. All these activities allow him to have a wide view over wine. Now matters his most personal wine. More personal, because the vines that give the fruit are at the family’s estate where he spends the holidays. The first Escondido to be revealed was the 2006 vintage. This is the fourth that has been revealed to the world. 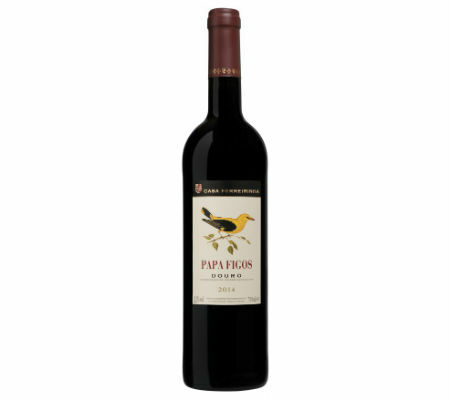 The reason because only 4 editions were shown along the ten years is related to the fact that this wine is a project that, while not being a game, lives around the family and the time available for field work. It’s not a game! Aníbal Coutinho takes it very seriously, in terms of personal, professional and obviously financial investment. Moreover, it is a high quality wine. If the agriculture, meteorology and the day-to-day work do not cooperate, Escondido stays home. Besides the family, there are two other major contributors: Vera Moreira and António Ventura, winemakers of the Parras Group. Here I have to put a sign! António Ventura is one of the Portuguese winemakers for whom I have great respect. He’s a Sir who handles many million liters. His goldsmith oenology is always impressive, but the sheer volume of work requires accuracy and concentration that not everyone knows how to do. The vineyard, with 15 years, is located in the football field used in family games … a football field that does not have the maximum dimensions, which are around one hectare. It has the minimum 0,4 hectares. But Aníbal Coutinho ensures that is not even enough for indoor soccer. Well, it might not be possible to fit 22 players and four referees there, but the Cabernet Sauvignon, Merlot, Syrah and Touriga Nacional grape varieties surely can. This choice of frape varieties is related to the Atlantic climate characteristics of the property. Aníbal Coutinho got inspired in Bordeaux and its vineyards, he says. The second last named variety, originating from the Côtes du Rhône, is planted inside the vineyard, in order to get shelter. The land, with clay-limestone soil, is located in Olelas, between Sabugo and Almargem do Bispo, in the municipality of Sintra, near Lisbon. As the crow flies, the sea is between 10 to 15 kilometers, says Aníbal Coutinho. This ocean proximity has caused unpleasantnesses … an oversight and there go the grapes. Moreover, treatments are not made, which makes the grapes even more vulnerable. That is the reason why in ten years only four vintages were made public. Escondido 2012 aged for 24 months in wood, splitted into a used French oak barrel and a used American oak barrel for 15 months, and a new American oak barrel for the remaining nine months of the second year. For historical reasons, and certainly also by religious influence, the Portuguese are afraid of the word luxury. But things are what they are. The Escondido is a luxury wine! Receives all the cares needed to be a luxury, it has the required great quality and quantity is small. If the agricultural year is lost or if the quality does not reach the level that the producer wants, the wine is to be drunk only by family and friends. 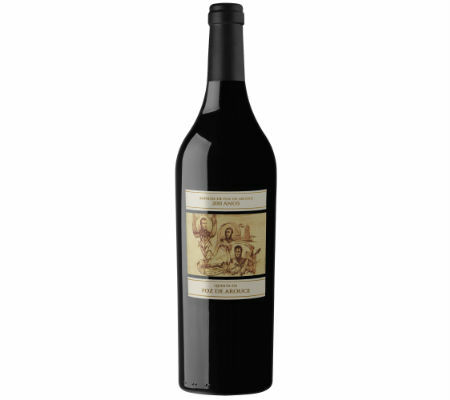 The Escondido 2012 had a production of 500 bottles of 0,75 liters and 100 magnum bottles. The location’s freshness can be felt on the glass. It’s a wine asking to be drunk at the table, around a substantial dish. It is to be drunk very slowly. The Escondido 2012 that I was shown at Jacinto restaurant was joined by a Cozido á Portuguesa. A very successful combination, because it is a wide diversity meal of meat and vegetables, which cannot be eaten in five minutes. One aspect to note is that, although it handles perfectly a heavy dish, Escondido 2012 is not a winter wine. I would not drink it with a salad, but it does not require to be served when fat food reigns at the tables. It is a fresh and complex wine with great elegance and a long finish. It evolves very well over the course of the meal. It has time to live and everything needed for a long life in the bottle. I do not venture myself in guessing deadlines, but as for longevity, Aníbal Coutinho thinks it can grow up to 20 years.